HOTTER THAN A FIRECRACKER freebie tag template/wordart by Creative Scraps by Crys. The PTU kit EMO 4th OF JULY by Crystal's Creations. 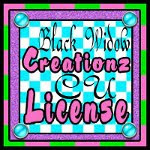 FTU mask #25 by Creationz by Witchys Heart. 1. Open up the template. 2. Open up the mask. COLORS>INVERT and LAYER>TRANSPARENCY COLOR TO ALPHA. 4. Right click and Alpha to Selection Raster 7, add new layer, fill with royal blue. Add noise. Alpha to Selection, SELECT>SHRINK by 9. Add new layer, fill with white. Go to FILTERS>DISTORTS>ERASE EVERY OTHER ROW. Keep presets. Repeat these steps with Raster 8. Delete original Raster 7 and 8 layers. 5. Open element 26 from kit (fireworks) and duplicate. Set them appropriately. 7. Right click, Alpha to Selection Raster 6 and add new layer, fill with red. Add noise. Shrink by 9, add new layer, fill with gradient blend (blend tool/bilinear blend) of red/white. Delete original Raster layer. 8. Open tube of choice, duplicate (total of 2 copies) then make one copy invisible (little eye needs checked in layer box) we will work with this one in a bit... Meanwhile with visible tube, COLOR>DESATURATE then duplicate and flip the copy. Arrange in the red/white blended rectangle we just made in step 7. When placed right, merge these 2 together and Alpha to Selection on blended rectangle... SELECT>INVERT and click on tube layer, EDIT>CLEAR. 9. Open as layers element 9 from kit. Scale to 178 x 353 and position on right side of tag. 10. Open as layers element 26 and scale to 126 x 136. Duplicate and flip copy. Arrange appropriately. 11. Open as layers element 4 from kit, sclae to 156 x 83. Duplicate, flip copy, place. 12. Open element 36 and scale to 90 x 92, duplicate, flip and place. 13. Make other tube layer visible again. Then scale to 220 x 466. 14. Open as new layer element 21, duplicate and place scattered across. 15. For the wordart- you may want to scale it down a bit...Keep the HOTTER THAN A black, but with the FIRECRACKER- Alpha to Selection. Add a new layer and use the paintbrush tool to draw blue and red into it and add noise. Delete original wordart layer. Then while still selected, grow by 3 and add new layer. Fill with white. Keep wordart merged all into one layer. 16. I used a font called Dreamed About You in blue, grew by 2 filled new layer with white and grew by 2 and filled new layer with red. Link layers, use rotate tool. the firecracker in template, and both of the blue layers in template. 18. Add the correct copyright info to your tag. Copyright symbol, the artist's name and website along with any license numbers should be clearly legible. 19. Use rectangle tool to crop- IMAGE>CROP TO SELECTION. 20. Save as .xcf so you can come back in and make changes if necessary. Save as .png with final product.